With Spain playing in the World Cup final on Sunday, you’d think soccer might be the only thing on my mind. But this week, I had a chance to meet a World Cup winner in person: Chef William Leaman, the winner of the 2005 Coupe du Monde de la Boulangerie, a.k.a. 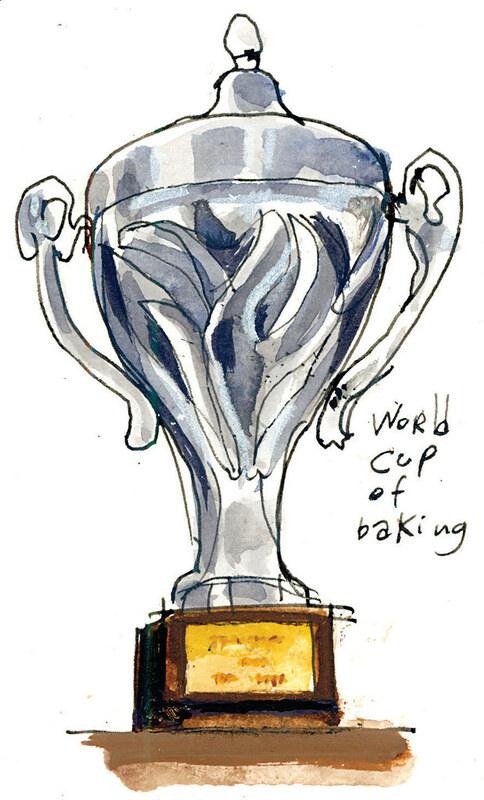 the World Cup of Baking, and now I can’t stop thinking about baguettes, croissants and macaroons. With the big trophy on his shelf and more than two decades behind the ovens, Leaman’s reputation draws people from all over the country to Bakery Nouveau. And not only to buy his signature chocolate mousse cakes but also to learn from the master bread artisan back in the kitchen. 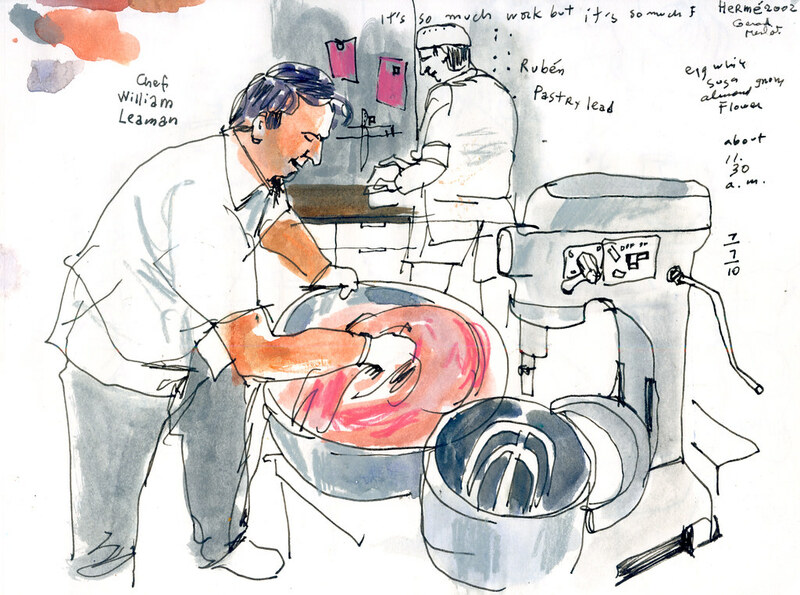 That’s where I spent most of my visit, holding on tight to my sketchpad and watercolor tray as Leaman, 37, worked with his team of bakers amid wonderful smells. Some were baking baguettes, others were preparing dough for croissants. Leaman wasn’t just giving instructions. 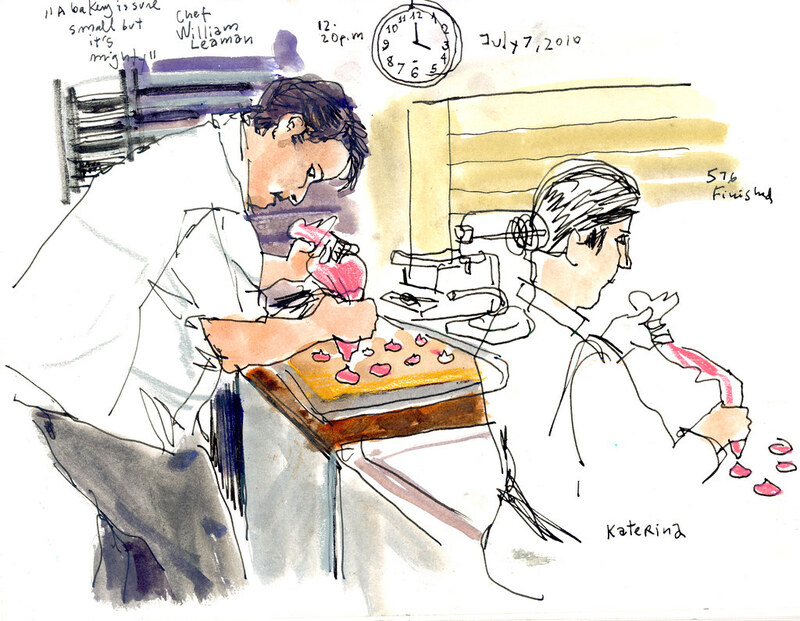 He had his hands full making Parisian macaroons — 576 of them. “A bakery is sure small but it is mighty,” he said as he squeezed them one by one onto trays. Helping him was Katerina Verganelakis, who plans to open her own bake shop back home in Princeton, N.J., after her training with Leaman. Leaman, a native Oklahoman, said the key to baking is to do what the French do. “Focus on flavor and joy of life … I don’t eat to live, I live to eat,” he said. French culture descends on Seattle Center on Sunday for an early Bastille Day celebration. You can see cooking demonstrations and a fleet of Citröens without missing the Spain vs. Netherlands World Cup final, which will be broadcast live at 11:30 a.m. at Fisher Pavilion. 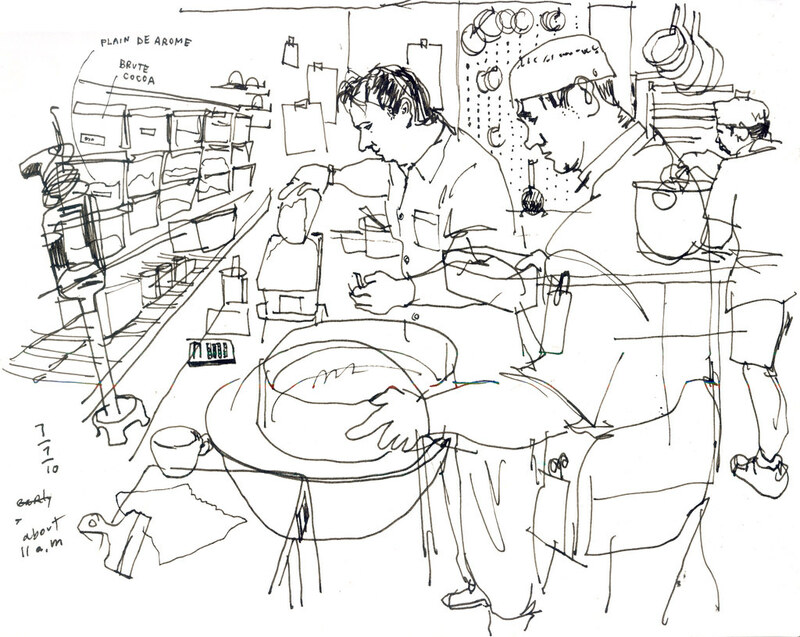 See a photo of me sketching on the bakery’s blog.